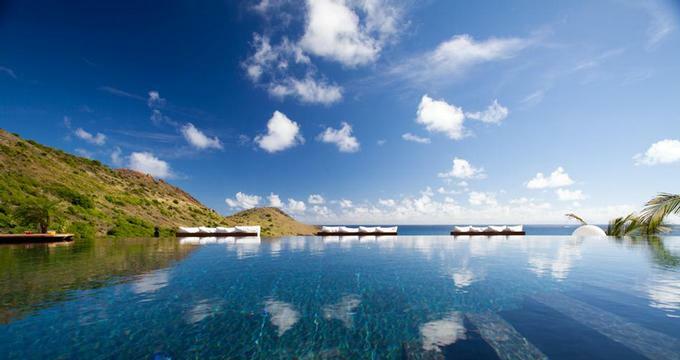 Hotel Le Toiny is located on the south-eastern coast of St. Barthelemy in the Caribbean sea. This secluded getaway offers quiet luxury villa suites, each with a private swimming pool and beautiful views of the sea. A recent renovation included the addition of a unique spa and fitness center. The island of St. Barths, eight square miles in size, offers secluded sandy beaches, scenery, warm climate and delicious French food. There are many activities to choose from on your getaway, including snorkeling (the hotel provides complimentary snorkels and masks), sailing, deep sea fishing, boating, tennis and horseback riding. Another popular sport is surfing on the nearby Washing Machine Beach. Guests can also take day trips to St. Martin, Anguilla, Saba and St. Kitts. There are just 15 spacious villa suites, ideal for couples. The architecture of the hotel has been influenced by old plantation houses and features soft colors such as peach, mint and pale lavender. The suites feature handmade furniture, including period four-poster beds, spacious bathrooms, and luxurious linens. Amenities include a kitchenette and a hammock. Restaurant Le Gaiac serves French cuisine and overlooks the main pool and the sea. St. Barths features numerous beaches many of which can be accessed by car. Car rental can be arranged through the hotel. Gustavia, the capital, offers boutique and duty-free shops as well as several art galleries. The staff can also arrange sightseeing tours of the island. St. Barths has tropical climate with year-round temperatures in the 80s. Le Several major airlines fly to Juliana Airport in St. Maarten. From Juliana Airport, St. Barths can be reached via a 10-minute inter-island shuttle flight. A villa suite for two people costs from Euro 580 during low season in the summer and from Euro 1280 during high season.